Cette page a été traduit en français. 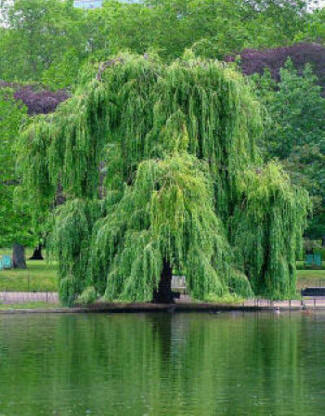 Willow trees live often live on river banks and salicylic acid is found in their bark suggesting, the trees use high amounts of salicylic acid to keep open their stomates and keep their roots relatively dry, pumping up water from them as much as possible. What is salicylic acid's speculative complementary deficiency hormone? If overall speculative role is true, where, when and which cells should synthesize SA? Meristematic cells should make salicylic acid in keeping with all the stimulating/growth hormones. SA should be made in greater amounts in the roots where more water exists and more SA should be made during the day and growing season. If overall speculative role is true, what should exogenous SA treatment produce? SA should open the stomates. SA should help induce new shoot growth. If overall speculative role is true, what should SA inhibit and stimulate? SA should perhaps stimulate shoot branching and inhibit root branching. SA should perhaps encourage epinasty. SA should open stomates letting some excess water out. SA should promote photosynthesis which incorporates water in its operation. SA should inhibit the effects of ABA. If overall speculative role is true, how should SA affect storage? SA should increase the water storage of cells. If overall speculative role is true, how should SA be transported? SA should be transported from the roots to the shoots. If overall speculative role is true, how should SA affect attraction and repulsion? SA should attract all the growth hormones and repulse the senescence ones. If overall speculative role is true, how should SA affect apical dominance? SA should encourage root apical dominance and break shoot apical dominance. If overall speculative role is true, how should SA affect Cell Division? SA should encourage cell division. If overall speculative role is true, how should SA affect senescence? SA should inhibit senescence, particularly shoot senescence. If overall speculative role is true, how should SA affect growth directions to provide balance in the plant? SA should encourage plant part lengthening. ABA it's deficiency partner should encourage cell and tissue broadening where it encourages growth (probably just in the roots). Decreases with increasing salinity. Why this makes sense - salinity increases desiccation and increase it deficiency analogue ABA instead. Found in high amounts in Willow bark Why this makes sense - Willows grow on river banks which are abundant in water (by nick at testsforge). The SA in the bark keeps the stomates open and transpiration at it's maximum. Induces future resistance to pathogen infection when released during infection Why this makes sense - ? See below number 3. Inhibits ethylene Synthesis 94 Why this makes sense - SA probably increase photosynthesis a water requiring process, the chemical reaction of which evolves oxygen thus decreasing the oxygen deficiency signal. Inhibits seed germination. salicylic acid causes "global repression of auxin-related genes... and inhibition of auxin responses" 93 Why this makes sense - ? Excess free water, along with excess oxygen, sugar and minerals are indications of plant injury and lysis of cell walls. Perhaps a superabundance of nutrients is an indication of plant injury and thus the need for global repression of all growth hormones. "Phenolic compounds, viz., trans-cinnamon acid, chromogenic acid, ferule acid, Salicylic acid, tannic acid and quercetin when applied with ABA, antagonize ABA action and restore normal seedling growth." 92 Why this makes sense - ABA inhibits activities involving water because it signals water deficiency. SA removes that inhibition because it is a signal that water is abundant.